Looking for a New Audi A5 Sportback in your area? 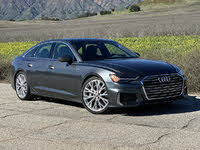 CarGurus has 310 nationwide Audi A5 Sportback dealers with 4,017 new car listings. Audi introduced the A5 Sportback to glowing reviews last year, which makes sense considering its bloodlines. 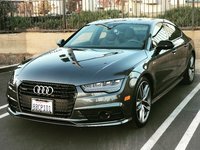 The 5-door is a condensed version of the elegant A7 hatchback mixed with some styling cues from the sleek A5 coupe and mechanically based on the A4. So it makes sense that Audi carried over the 2019 A5 Sportback. All of the A5 Sportback trims are powered by a turbocharged 2.0-liter 4-cylinder engine that produces 248 horsepower and 273 pound-feet of torque and is mated to a 7-speed automatic transmission with Audi’s quattro all-wheel-drive (AWD) system. That powertrain gets 23 mpg city, 34 highway, 27 combined. Audi offers four different drive modes, Comfort, Auto, Dynamic, and Individual, that adjust the steering, shift points, and damper control. The A5 Sportback is available in three trim levels: Premium, Premium Plus, and Prestige. The interior is luxurious yet simple and built with the highest quality wood, leather, and metal. And thanks to the hatchback, it’s also spacious–21.8 cubic feet of cargo space behind the second row and 35 cubic feet with those seats folded. Tucked inside the understated cabin is a wealth of technology. Standard tech features include a voice-control system, Bluetooth, Apple CarPlay, Android Auto, a rearview-mirror camera, a 10-speaker sound system, 2 USB ports, and Audi’s MMI infotainment system with a 7-inch color display. Other available technology includes the Audi connect CARE assistance and security services, a handwriting-recognition system, and a 19-speaker Bang & Olufsen sound system with 3D sound. The A5 Sportback also comes standard with features like 3-zone climate control, a panoramic sunroof, an 8-way power driver’s seat, an auto-dimming rearview mirror, ambient LED interior lighting, shift paddles, heated side mirrors, a power tailgate, and LED taillights with dynamic turn signals. A new Black Optic Plus package is also available. The package comes with a sport suspension, 19-inch wheels with titanium finish, black optic exterior-mirror housings, black side-sill blades, black rear-lip spoilers, a 3-spoke flat bottom perforated leather steering wheel, piano black inlays, and contrast stitching in blue. There’s also an updated Convenience package that includes blind-spot monitoring and rear-collision alert. Park assist helps the driver with parallel and perpendicular parking by taking control of the steering while the driver accelerates, shifts gears, and brakes and it now comes standard on the Prestige trim. In addition to the driver-assistance systems listed above, standard safety features include electronic-stability control with traction control and secondary brake assist, a power central-locking system with safety unlock if airbags deploy, a vehicle immobilizer, and a tire-pressure monitor. The Insurance Institute for Highway Safety (IIHS) gave the A5 Sportback high marks across the board, with the exception of the headlights. The National Highway and Traffic Safety Administration gave it a 5-star overall rating. If you're looking to comparison shop, you can look at the BMW 4 Series Gran Coupe as well as newer, edgier competitors like the Kia Stinger and Acura TLX. What's your take on the 2019 Audi A5 Sportback? GuruC2R1V 18” wheels vs. 17” inch on a4 give the a5 a somewhat less smooth ride. Disappointing. GuruC2R1V Audi 18” wheels make for a less smooth ride than the 17” on the a4. 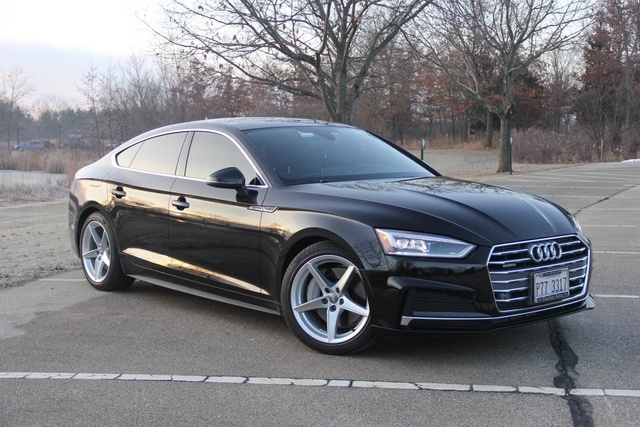 Have you driven a 2019 Audi A5 Sportback? Enter your zip to see incentives for a new A5 Sportback in your area. Looking for a Used A5 Sportback in your area? CarGurus has 1,644 nationwide A5 Sportback listings starting at $33,477.